Studio Visit: Lilith Rockett — Portland Supply Co.
Lilith Rockett graciously hosted us in her lovely Sunnyside neighborhood studio. 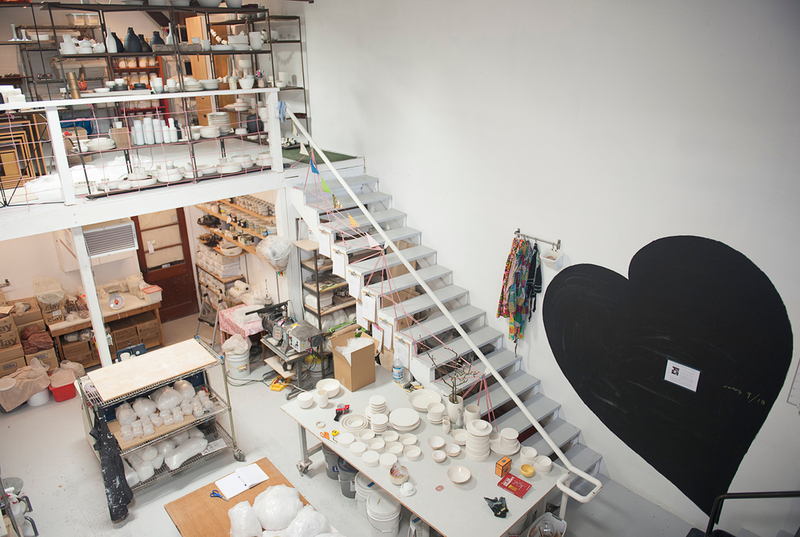 And the studio made quite the impression, with two lofts opposite of one another, predominantly white and chalked full of her ceramics. Orders were plentiful and it was great to see her so busy, with so much eye candy for us to see! 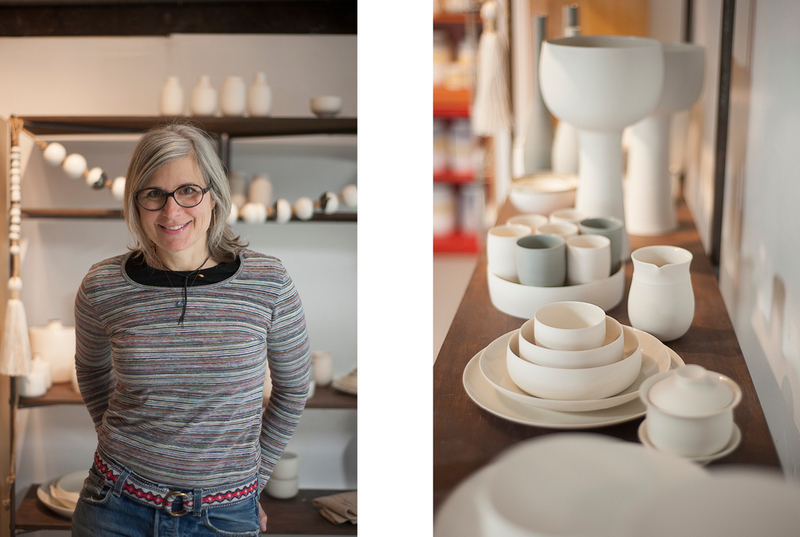 Lilith is self taught primarily in porcelain ceramics, that makes beautifully clean lines and minimal pieces. Her line is based around social arrangement meant to evoke a sense of community and openness. 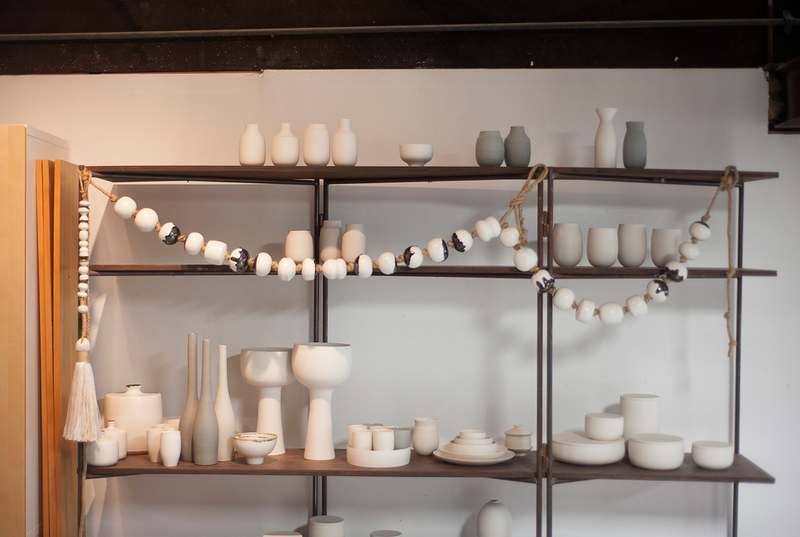 Lilith’s choice to use mainly white unglazed but polished ceramics makes her pieces stand out. Purpose and utility are the beginning and end of all her pieces, they are meant to be functional and lived with. 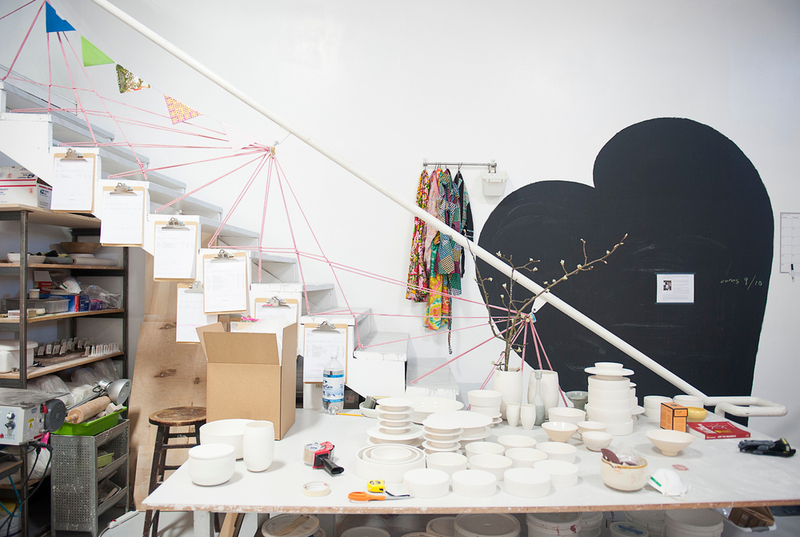 From everyday to entertaining Lilith Rocket’s ceramics feel both comfortable and so special. Enjoy our photos from our visit with Lilith and her thoughtful interview! My husband Eliot and I were living in Los Angeles' Chinatown, and loved many things about our life there, but in 2007 when we adopted our daughter, Opal, we really wanted to be closer to our family. My husband's parents are in Eugene, his sister 's family is in Bend, and my sister and her family live in Hood River. What has kept us here is the ease of our life. It is so beautiful: we love the weather; we love hiking and mushroom hunting; and foraging and exploring. Portland is great for families, and also really nice for artists. I can afford much more space for my studio and Portland is a really lovely place to live. I feel like its a perfect small city to base our lives out of, and then we can travel a lot and spend time elsewhere when we get the urge for the bigger world. Plus the food and the coffee can't be beat. You can throw a stick and hit good affordable food. Most places can't say that. I love that in Portland there are so many people taking risks with starting their own businesses, launching their brands, and making their art. There is a culture here that is both supportive and collaborative. I don't think of my work or myself as a brand. I've always thought more along the lines of clarity of vision and voice though my work. My work evolves as I do, and is a response to my life experiences. 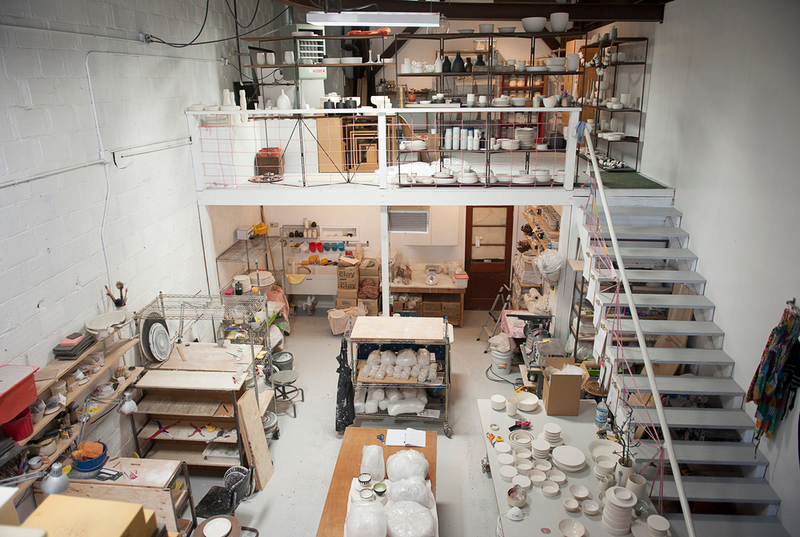 My world-view and values are expressed through what I make and how I make it. I'd love to spend all of my time making work and playing with new ideas, but as a self-employed artist there is a lot of business work to do as well. The challenge for me is to stay on top of the business end of things. I'm very intuitive about how I do everything, which makes business analytics very vague. I'm getting some support from the pros for that part. My biggest inspiration for my work is not so much a thing or person, but really more of a feeling of wholeness and freedom and connection. I achieve that by spending time in nature, time with my family, and really just living a balanced, but ultimately very project-filled life. My husband Eliot, and my daughter, Opal, are my favorite collaborators and co-conspirators and probably my biggest human inspirations. In terms of artists that inspire me, there are so many: Toshiko Takaezu, Lucie Rie, Georgio Morandi, Grayson Perry, Magdalena Suarez Frimkess, Maggie Nelson, Lydia Davis, Brian Eno, Patti Smith, Chef Matt Lightner and all of the brave, strong, and big-hearted people I have in my life. I like the seasons, the smells, the very dark winters and long days of summer, and what can feel like limitless possibility at times. There are a lot of very creative people here really trying to get behind what they believe in and love. That's inspiring, and Portland seems to have a lot of that going on. Hands down, it's my wheel. I love sitting at my wheel and making pots. Love it now and hope to forever. I like that I have different levels for different parts of my work. I love having a photo studio up in one loft and my office in another loft. On the main floor is enough space to have production cranking and a little dance party as well. I'm so grateful for all of the support I have. I don't know what to do with all of my free time. Stumptown Belmont and the whole amazing crew there.